I feel like we need a little savory in our lives, no? We've had quite a stint of posts featuring all things sugary and sweet (which I'm 100% fine with! ), but honestly, every once in a while I feel there needs to be a break in the monotony. 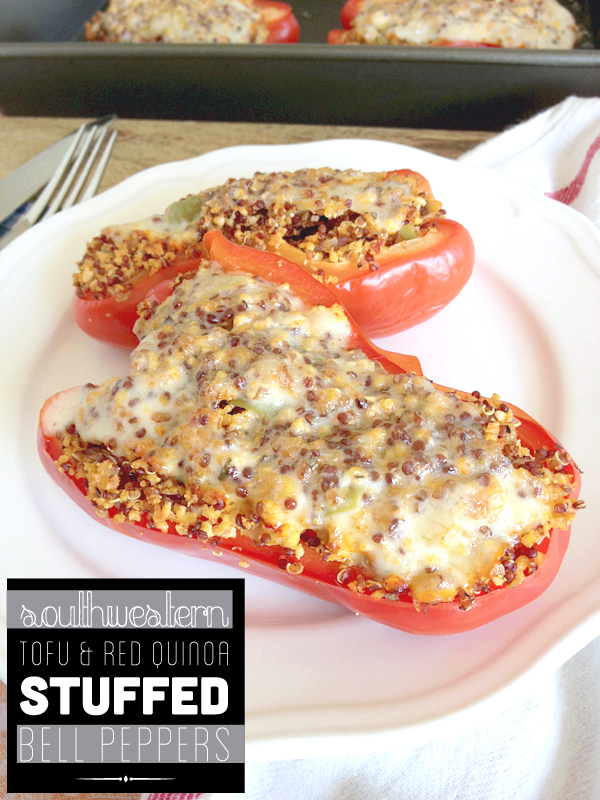 So from one extreme to another, let's talk stuffed bell peppers! Ever since I was a youngster, I've actually really enjoyed this dinner staple. At least it was a staple in my home- we had it often. My mom always made them and I was always happy when she did. Granted, back then it was usually green bell peppers and stuffed with a mixture of onions, ground beef, and rice. Since then, things have changed just a tad. For one, I almost always choose to cook with red bell peppers instead of green. Why? In my humbled opinion, they taste better- sweeter and less...what's the word...metallic? Of course there's also yellow and orange- and those taste just as yummy and will work just as well, but I usually find those colors to be more expensive than the green and red version. Why? They're all the same darn thing! Just different stages of maturity. Oh well. Honestly though, you can use any colored bell pepper you have and prefer. Second, here in the Main house we try to eat as little red meat as possible. You know, for health reasons and bladda bladda blah. And seriously, when we both crave beefy yum yums, we'd much rather go get a steak or burger and have like the maximum beefy goodness in our mouths- unmasked by anything. Why "waste" our red meat eating fiesta on a dish mixed with a million other ingredients? Exactly. So for this dish I choose super firm tofu and red quinoa to get the essential protein we need. Yep, quinoa is an excellent source of protein! Lastly, we also try to refrain from eating too much white starch and instead incorporate a lot of whole grains, legumes, and beans in it's place. So, replacing the white rice is, again, the red quinoa. Look at you serving a double duty, little quinoa! If you're new to the whole quinoa world- HI! Welcome!!! It's so fun! There's different colors- from red to tan, and also black and multicolored. I interchange these often- whatever I can find on sale or for a good price is usually what I buy. Yes, some forms have better nutritional facts than the others- but really, feel free to get what you're comfy with. 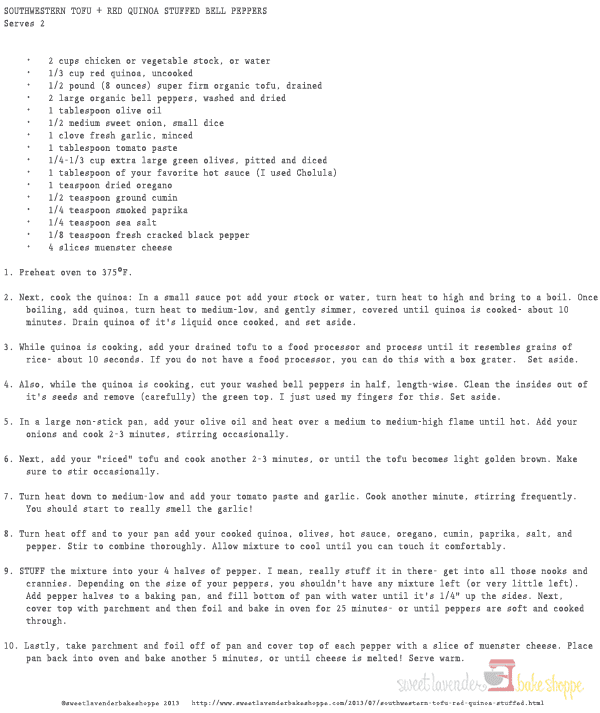 I happened to have red quinoa on hand- but you can use any of the colors here. The flavorings and such are pretty much the same as what I remember- but of course I can't leave well enough alone- I gave it a few little kicks. The added hot sauce and green olives give this dish a sort of Spanish/Southwestern feel and I just love it! The olives provide a little bit of tang and acidity that cuts through bites of the mixture- its just great. If you just can't stand olives in any form, feel free to leave them out (I'll only hiss at you a little). 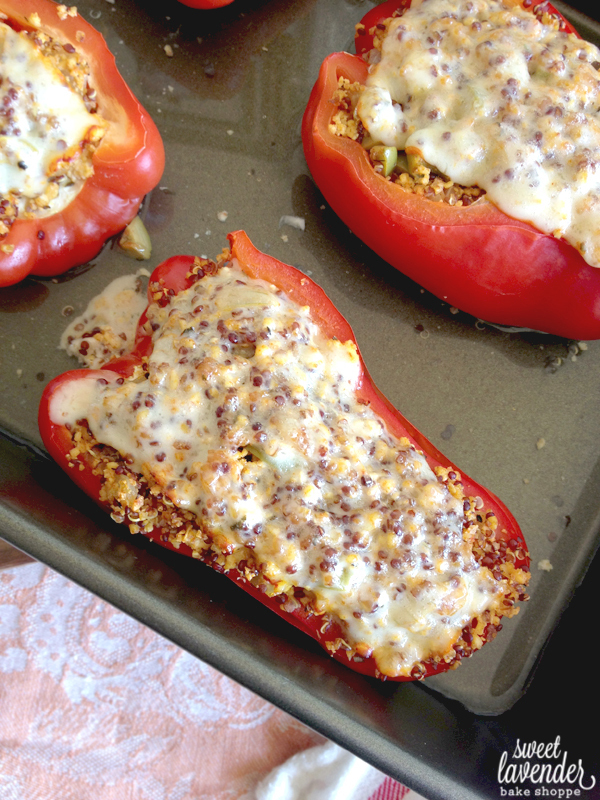 Stuffed bell peppers are like the perfect one dish wonder! You have your protein, veggies, and starch all wrapped nice and neat in a little bell pepper package. Love that! 2. Next, cook the quinoa: In a small sauce pot add your stock or water, turn heat to high and bring to a boil. Once boiling, add quinoa, turn heat to medium-low, and gently simmer, covered until quinoa is cooked- about 10 minutes. Drain quinoa of it's liquid once cooked, and set aside. 3. While quinoa is cooking, add your drained tofu to a food processor and process until it resembles grains of rice- about 10 seconds. If you do not have a food processor, you can do this with a box grater. Set aside. 4. 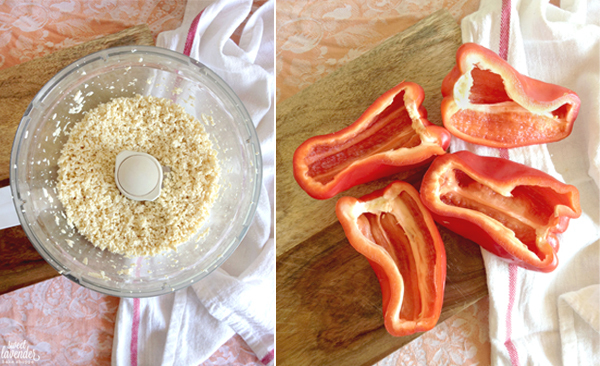 Also, while the quinoa is cooking, cut your washed bell peppers in half, length-wise. Clean the insides out of it's seeds and remove (carefully) the green top. I just used my fingers for this. Set aside. 5. In a large non-stick pan, add your olive oil and heat over a medium to medium-high flame until hot. Add your onions and cook 2-3 minutes, stirring occasionally. 6. Next, add your "riced" tofu and cook another 2-3 minutes, or until the tofu becomes light golden brown. Make sure to stir occasionally. 7. Turn heat down to medium-low and add your tomato paste and garlic. Cook another minute, stirring frequently. You should start to really smell the garlic! 8. Turn heat off and to your pan add your cooked quinoa, olives, hot sauce, oregano, cumin, paprika, salt, and pepper. Stir to combine thoroughly. Allow mixture to cool until you can touch it comfortably. 9. STUFF the mixture into your 4 halves of pepper. I mean, really stuff it in there- get into all those nooks and crannies. Depending on the size of your peppers, you shouldn't have any mixture left (or very little left). Add pepper halves to a baking pan, and fill bottom of pan with water until it's 1/4" up the sides. Next, cover top with parchment and then foil and bake in oven for 25 minutes- or until peppers are soft and cooked through. 10. Lastly, take parchment and foil off of pan and cover top of each pepper with a slice of muenster cheese. Place pan back into oven and bake another 5 minutes, or until cheese is melted! Serve warm. Yum yum yum! These look so delicious! Can't wait to try them! P.s. I found you through the bloglovin' link up! You're so welcome girl! And yes, totally healthy! Awesome, right?! 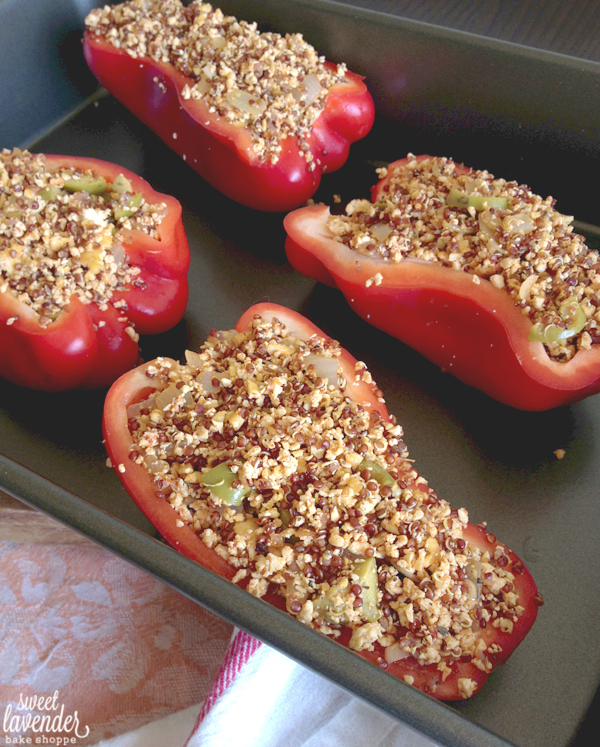 You inspired me to make my own version of these stuffed peppers & they were amazing! And this is coming from a woman who does NOT cook. Thanks! Yeah girl!!! Rock it!!!! I'm so curious- what was in your peppers???? YUM! It was similar to your recipe: I did regular quinoa, black beans, onions, garlic, diced tomato & green peppers, some garlic salt, pepper, and topped it with muenster cheese. Sooo good! Thanks again for the inspiration.